Who do you mourn for? Lovely! God bless my soul! Hmm? You again? Dear reader, you are a jewel of the ocean, the acme of blog readers, etc etc, but you can’t expect me to stay with you forever and ever, can you? Okay, fine one more recipe and that’s it. I mean that. I had wanted to test out quinoa flour and amaranth flour, but there was no quinoa flour that wasn’t absurdly expensive, so I gave up, no, sorry, made my own, again. It’s tedious, but at least you avoid the nasty taste so many store bought flours possess. I’m going to cut this short, it worked, but it’s nearly identical to the all Quinoa Flour Bread. That’s not a disparagement, that bread is really great. I’d praise it more if it weren’t my own recipe, but modesty prevails and I quietly mumble its praises. The one thing I love about this is that one minute out of the oven it was cut without any crumbs. I do think the texture is slightly firmer, but that might be the lessened water. Go to the quinoa flour bread page and you’ll get all the information you’ll ever need. This is just here because it worked. It’s never a bad thing to know additional flours work and because it was too different to list as a variation. I used two small tins, I think they’re four and a half inches each, because you get a better crust to, ummm, not crust? ratio, but you could use a normal sized loaf tin and it should be fine. I just prefer to list what I used so you’ll hopefully avoid any failures due to me. Your failures are yours to accept. I’m perfect! Heh. Okay, until later. Potato time too. I’ll have to cover them with more compost and feed soon. 2. Grease (With Butter or Olive Oil) and line a 6×3 inch loaf pan. 3. In a large bowl mix together the Egg, Olive Oil and Salt. Add the Quinoa Flour, Amaranth Flour, Flaxseed and Baking Soda and stir until combined, then add the Water and stir together until smooth. Rest for 5 minutes until batter has thickened. It will be lumpy. 4. Pour batter into prepared tins and bake for 40-50 minutes, turning halfway if needed, until brown, the tops firm when pressed, and a skewer comes out clean. 5. Remove from he tin and let cool completely on a wire-rack. Oh, no! I did it again, dearest reader, I’ve thought of how to start this, imagined something silly and now I can’t keep my thoughts coherent. So, it’s been two years already. Golly! Gee whiz! Holy Sh…Woah! Family-friendly blog! Cover everyone’s eyes, dear reader! I’m typing this in fragments, so if anything seems disjointed that’s probably why. So, two years, two long years and I haven’t learned a thing. No, I’m joking. Come back, don’t leave me! Funnily, you’ve stuck by me, once gentle now dear readers, and for that I’m grateful. Really, no mater how much I joke or josh you know that I’m humbled by the support and help I’ve received these past two years. I can only hope that I’ve repaid it in part at least with the work I’ve put into the site. What work?! How dare you! Why I…if I had a door that’d slam you can be sure I’d slam it with righteous indignation. Instead I’ll share a little of what I’ve learned. Because here at Pep’s Free From Kitchen, free-from because someone already had the address, it’s not just about sharing it’s about educating. Or trying to at the very least. It’s also about me, often-times Jack, sometimes your humble narrator, your forever friend, the maundering man behind the keyboard. Always and ever: Just me. So what do I know? Or rather: What have I learned? Proofread your posts. Oh, so many typos over two years. And that’s just the ones I’ve noticed. What be serious? No! Why? Well. My Sweet Potato Fries were a hit, but did you know I have couple of seasoning blends too? The need to balance what you give and what you take away. I think in the time I’ve been sharing and creating recipes, typing up thoughts and tutorials, that I’ve given back enough that I can now have fun with all of this. It’s easy to be swept away with the idea that if you’re in a position to help so you better give it your all, without thinking of your own well-being and mental health. That’s wrong, do what good you can and just enjoy it. In saying that. Chicken cooked in squash purée, oil free too. You set the rules and your own responsibilities. Getting heavy, huh? I’ll keep it brief. I can only speak for food blogs, even then only about my own experiences whatever their worth, but the one thing I decided fairly early on is that I would stick to set rules. How the posts would be set up, how family-friendly and suitable for all audiences they’d be, how much of myself I left bleed into them, yes that’s a consideration I’ll elaborate on in time too, many things that have helped shape the blog and make it what it has become. I also understood I had a responsibility, perhaps one I chose to accept or create, that was: To be truthful in all things. To not only show the good side, but the other sides: The failures, the struggles, the limits I face, the ways I cope etc. I don’t post experiences without knowing what they’re actually worth, I’ve never positioned myself as a source of absolute truth and so easy is it to state opinions as fact. I’ve always had the best interests of my dear readers in mind, even if they never realised it. I stand by that decision. It doesn’t make me that different, or special, but I have seen others who didn’t care, who valued themselves too highly, so it’s still something I take some small degree of pride in. Marinaded Chicken With Peanut Satay Reduction. An old recipe, but an interesting one. It came from a meatball in sauce recipe that I changed completely. Don’t forget the rice, always fluffy with my recipe. O.M.G! I lost 140 Pounds on this Diet! Follow me to find out how! Should you go gluten free to lose weight like me?! I cut out these foods and lost ten stone! See? It’s so easy to be irresponsible. What you do is up to you. I’m blending the two paragraphs a bit, but hey, I’m old. I remember when the internet was slow and two megabytes was a twenty minute download. Cut me some slack. Yoghurt and Rooibos Curry. A original recipe. Sadly I can’t tolerate that much dairy in a meal now. Don’t forget humble Jasmine Rice. A Voice for the Voiceless. Okay, negativity aside. One thing about blogging is that it really shows how much variety there is out in the world. If you’re shy or introverted there’s no reason you can’t set your thoughts down. You set how they sound, how much you show, all you need do is to stay within your comfort zone and just enjoy the experience. You’ll be surprised at how blogging about your interests, or passions, can help expand them. Being able to talk about what you love, rather than being pressured to listen or conform to other’s stories or standards can really make a huge difference. I’ve often said that these posts can be cathartic and it’s remained true. Finding others who love what you do can make the world of difference to you. You never know until you share and see what others are sharing. I can’t believe how unloved this Gingerbread blend is. It’s incredible when combined with treacle. No Standard Blogger. There is certainly a template in all walks of life. Bloggers are no exception, but as with all things you don’t have to try to fit a mould. I’d say it takes a lot of posts to find you style, your voice if you’d rather, and there’s nothing to say it won’t keep changing. This started out as just a recipe blog, perhaps a trifle stuffy at first, but in time I’ve found the tone and format that best suits. The garden crept into my life and in time Jack appeared and a new facet of my life was worth blogging about. Take your time. Read other blogs and most importantly be yourself. People will come to read what you say, why put someone else’s words in you mouth? You don’t need an enormously extensive elaborate vocabulary, or an alliterative appreciation of assorted appellations, that can get tiresome and that’s my shtick! If I can be vain about one recipe, let it be my Flouress Nut Cake. Use your tags and categories. I’m glad I kept my tags and categories simple. Tags for ingredients, mostly at least and categories for meal types, again: mostly. It keeps things well organised, helps spread your site around and means you and others can find what you and they need. The longer a blog carries on the larger and more complex it becomes, a good clean and careful start can be extremely helpful. Take your time starting and if needs be clean up as necessary. Sweet Mango Curry has become a part of my meal plan. Richness from the hemp and sweetness from the honey. Success: That ever-changing chimera. For me it’s not about numbers, I’ve been caught a few times, but pride will always end up painfully reminded of its limits. It’s been the case that the occasions I most cherish are the simple comments, the heartfelt appreciation, the gratitude the sharing of experiences and of recipes, failures and successes both. These are things you can’t quantify or predict. Just be respectful, be kind, show your support to others when you can, link to your sources and hope that others are doing the same. Success for me has been many different things over time. Rarely a number, more often an unexpected kind word or fun conversation. This is a free blog, it might be different for someone trying to make a living from this, but I don’t think it’d be that different. Cashew Butter Gravy An accident made me this most delicious gravy. Consumable Content. You need to adhere to strict multifaceted bi-symmetrical synergism to really screw with your readers. Heh. I haven’t spoken very specifically on the food side of blogging, have I? It differs from person to person and blog to blog. What I like to do is break things down. Talk about texture, taste, tricks and tips. But also, if applicable, the behaviours and properties of free-from ingredients as best I understand them. I will say I’m interested in the nutritional side of food, but not in copying and pasting articles or making outlandish claims. Talk from your own experience with food, it’ll be vastly more interesting than stating the fibre content of linseeds you pulled off some Google search. You don’t have to pretend expertise to talk food’s worth. Just tell your story with food in your own words. It’s you call, I’m just saying think about it. Tahini has played a huge part in my diet. So many no heat sauces to try! So, I’ve shared a bit of my journey with you. Perhaps you’re new and wondering when this post will end, or perhaps you’re an old hand and have tuned out already or are grimly enduring it. Whatever, I can promise you one thing: I will continue this blog, continue putting in all the work and effort I can, stay flippantly irreverent and studiously serious in equal measure, until it stops being fun and I don’t see that happening any time soon so have no fear, you’re stuck with me and I with you all. And I wouldn’t change it for the world. A large garden perhaps, but not the world. I say this with a happy heart: I’ll see you later, Dear Reader. Of course, I’ll just have to assume that you’ve already followed my Tutorial on how to acquire a giant thumb. This will be more verbal than pictorial, no, not pectoral, stop flexing! Partly because it’s just simple and partly because I wasn’t sure it’d be worthwhile taking a photo of boiling fruit. So, first things first: Every celiac has a flourless peanut butter cookie recipe, be they of limited ingredients, the best ever or, you know, yadda yadda. What makes mine different? Not much, they’re not as sugary as other recipes. I remember when I first tried a recipe like this, I ended up with a very upset stomach due to all the sugar. A lot of these recipes are almost 1:1 between peanut and sugar. Mine is mostly peanut butter, which results in a lovely crumb. They’re light, sturdy and I have never tired of them. I’ll post the recipe below, the filling will be rougher since it’ll be up t you to decide what you’ll be using. This is so simple, really basic, but if you didn’t know how they bake, that they can be made as a single cookie and how they rise, you might not realise you could do this, but have no fear, dear reader, I’m sanguine and foolhardy enough to try and lucky enough to have succeeded. 2. 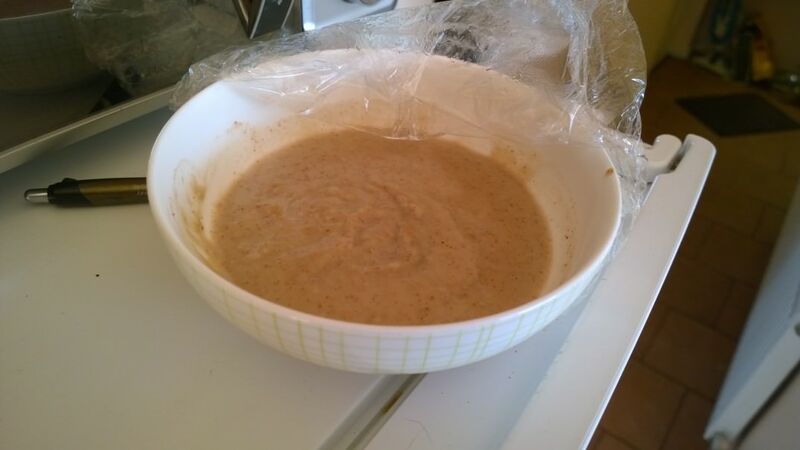 Put everything into a bowl and mix, with an electric mixer or fork, until a thick clingy dough has been formed. 3. Form into 1 Tbsp sized balls and (Just check below for the how to) flatten onto Greaseproof Paper and bake for 15-20 minutes until golden brown and firm to the touch. Then remove from oven and rest on tray for a further 10 minutes. Then let transfer and let cool completely on a wire-rack. So, that’s pretty simple right? I think so, no real way to make a mistake. You don’t have to make this plain at all, that’s just how I made it today. I find the egg version is best for a single large cookie, but feel free to check out all the egg variations in the original recipe. Firstly I’ll talk about the dough. It is indeed a dough, you can work it by hand after a certain point if you’d like. First it’s a wet mess and seems like it’ll never come together, but gradually it starts to thicken up and become firm. It can be sticky at times, oily at others, it just depends on your egg size and the nut butter used. Use natural, all skins and nut and nothing else, or you’ll end up with an oily mess. Now we’ll talk about what you’ll need to get the right indented shape after baking. You could be making the filling while preparing this I’ll leave that for you to decide, I’ll just split it up for the ease of typing it out. Step…I’m joking, you don’t even need numbered steps for this. You’ve made the dough. Split it into two parts, flatten out the first into a circle, rough as you like, onto a greaseproof paper lined tray. About a quarter inch thick, it’ll rise, but don’t worry to much. If all else flip this over and call it a giant cookie. The reason for all this fiddliness is that it ensures the cookie bakes evenly and you have a slight indentation for the filing. Just flatten the lot and you’ll get a large dome, perfect for spilling your filling everywhere. So you’ve got a flattened circle. Next take about a quarter of the dough, roll it into a snake, surely you’ve played with modelling clay, and then curve it around the outer edge of the circle. What you’re looking for is almost a pie crust shape. Don’t be afraid to press the two parts together until it’s all smooth. Repeat until you have a raised edge. Then take a fork and just poke the middle repeatedly, then push the sides up to ensure it’s as high as possible. Next: Bake per instructions. It’ll rise in he middle, but you’ll end up with a slight dent and a better baked centre than if you just flattened the whole thing. It bakes about the same, takes a while longer, but not a lot Just press it gently to see if it’s firm. It’s almost a shell over a softer textured centre. There’s a lovely crumb inside the smooth exterior. I’s light enough, not wet or mushy, I really enjoy the texture. It tastes as you’d imagine something made almost entirely of peanut butter to taste. Add the filling. “What filling? !” Whoops. So, you have a giant cookie just waiting to be filled. What shall we use. That’s up to you, you could be healthier and use a chia seed jam, or perhaps be a cheat and use store bought jam. I used about 200g of mixed blueberries and strawberries, added a splash of maple syrup, this is a treat and I refuse to compromise on the sugar element, which I boiled down, under cover until the fruit was soft then boiled uncovered so the sauce could thicken. It’s either a compote, a dessert sauce or just sweet fruity mush, whatever you like to call it. Etymology need not concern us at this stage. Just pour it on top of the cookie, here the slight dent helps keep it from rolling off. It’s not a very deep recess, but it’s a large cookie so it takes a fair bit of sauce to overfill. Now here’s where the recipe shines. You can pick it up and it’s perfectly stiff, grab it, toss it, okay don’t, but you can move it around like you would a small cookie. No racking, breaking or tears before bedtime. It’s ultimately a bit of fun. I like to think it’d make for a great birthday cake alternative for kids with numerous allergies and intolerances. Or just an adult in need of a sweet pick me up. Whether you decide to make it plain or experiment with different flavours is up to you, I just wanted to show you how easy it is to make this eye-catching cookie. I never scoff at quick and simple recipes, they’re the ones you can return to time and time again with ease. Nothing to say you couldn’t go wild and really make this pop. If you do decide to try it out do let me know. Any questions just pop them below. Either cut it or just grab it and take a bite! My new year’s resolution? 1080. Now that’s a prompt recipe. We went from the idea to the end product in just two posts. So here we are. Now, in possibly too much detail, we figure out why, what and, no, that’s it. So I’ve gone from Gravy to a double boiler custard sauce. A diary free sauce no less. Let’s start with the first ingredient. This will be less humorous and more educational, or attempt to be. The coconut cream. Why? Twofold, I can’t tolerate milk and nut butter, cheese and nut butter is no problem, but milk seems to sour in my stomach, not always, but consistently enough to be bothersome. Secondly, as we’re not using diary, coconut cream is fatty and rich. A nut milk, or soy, but no soy for moi, would work, but whether it’d have the right richness is questionable. If I had no trouble I’d have opted for double cream, coconut cream will do here. Nut butter’s up next. Natural works best, better control of the oil and texture in recipes, if you use smooth and it already has sugar added it can make a mess when baked. Same problem here, oily custard would be icky. If I had cashew this would be milder and closer to a true custard sauce, as it stands it works fine an you can use any nut butter. Next: Egg. Okay, eggs add richness to a sauce. Well, egg yolks, but waste not want not. If you want it richer, use two egg yolks. I’ve used them since the early days, you just need to watch for them getting scrambled. Hence the cooling after melting. This is based on my curd so an egg was a must. The gravy is rich, but it wouldn’t have the consistency I wanted in a custard so this needs an egg. Sugar: Yes. And…What? You need the sweetness, plain peanut mush, skins on remember, and coconut don’t make an appetising sauce. Vanilla extract because, well, it’s a custard, of a different colour, but a custard none the less. Chill for pudding. I preferred it hot, but just about. What’s next? Method? Sure. Did you note my specially constructed double boiler? Yeah, glass bowl meets pot and you can make curds, ganache and custard without risking scrambled eggs and disgustingly burnt remnants at the bottom. Do whatever suits yourself. I’m rough and ready, in no regards fancy. You know me, dearest reader, striving for the best result I can accomplish with what I have. So boil, pop it in and stir, I used a plastic coated whisk, I’m not sure if it matters, but just in case it does I’ll add that. It does seem to take a while to really start, but when it does it thickens without much effort. Now, I don my chefs whites and pretend I know what I’m talking about. Bear with me, and apologies to trained chefs. You could think of this as a rough pastry cream, but in my experience, limited to a wheat roux based pastry cream, I didn’t find this fit the bill. It’d be closer to a cornflour based pastry cream, but even that pales in comparison to a roux based custard. Don’t cry, we don’t need wheat. It’d be closer to a crème anglaise, at least while warm. You see if you let it cool it’d resemble an American Pudding rather than a pourable custard. While warm the consistency is much smoother and would be delicious with cashew butter if you’re diary intolerant. Chilled it makes a enjoyable treat that tastes strongly of coconut and peanut. Now if you wanted to use this in a dessert I’d say as a warm sauce would be better. It’s just barely warm when you take it off the heat so don’t mistake me when I speak of it being warm. Over a fresh apple tart, fruit or just eaten cheekily with a spoon this is a pretty nice sauce. If you wanted it on a cake I’d think of it similarly to a thinner curd, a surround of buttercream could hold this in the centre, but once cut, it would slowly dribble. It’d be better poured over a slice of cake. So, I think this can be said to be what I expected. I made it up in my head and the end result matched what I thought. So, where do we go with it now? Hard to say. I’d say it could make a cheese sauce. You could perhaps use it in a lasagne. You might have to thicken it more, but with cheese and combined with meat or vegetables it might not be as thin anyway. I’ve frozen and baked my Cashew Butter Gravy in Cottage Pies and it holds up well so there may be something in that. That’ll be up to an intrepid reader to decide to undertake. So ultimately it’s a simple sauce that cover more than my own allergies. I’ve often said it never hurts to branch out and if in doing so you help someone else then it’s a win-win situation. Alright, that’s that. Until we meet again. 1. Put Peanut Butter and Coconut Cream in a glass bowl and heat for one minute in the microwave or until melted. Let cool. 2. 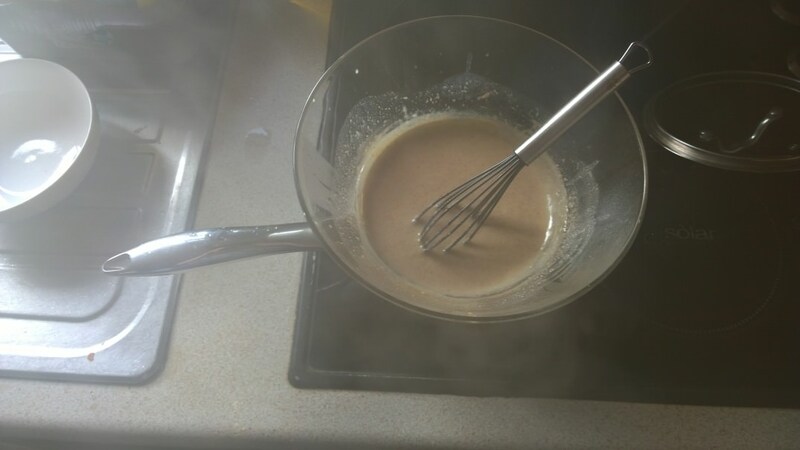 Add the Egg, Sugar and Vanilla Extract and Whisk everything together. Bring a pot of water to a boil and place glass bowl over the pot making sure it doesn’t touch the water. Reduce the heat slightly. 3. Stir constantly until mixture becomes thick, but still pourable. Takes about 10 to 15 minutes. 4. Either serve hot or pour into a bowl, let chill and serve as a pudding. This is a recipe blog, right? How much is left now? I need six more to finish? Live Strive Thrive Grow strong! Last one? These are done? Just a quick post. Nothing serious this time. Today marks four years with the weight off. Ten stone, or 140 pounds, and not once in all those years have I relapsed, faltered or messed up. I’ve given up more than I can remember, gone through more than I’ll ever tell and I still have ways to go. But today I want to write to a very special person, someone who took a chance and changed their lives, this isn’t a letter to the fat-days, this is to the progenitor of the, what should we call these days? The Jack days? The Harvest Days? Days filled with hope? Maybe that’s what I should call my diet plan: A Diet of Hope. There’s the title of the post at least. So let me have this moment of silliness, readers of mine, it’ll be back to normal around here soon. Dear Me, Six Long Years Ago. Firstly, thanks for taking the chance and looking into coeliac disease. That wasn’t your only problem, but it got you started. I don’t envy you the withdrawals and the clawing, desperate hunger, but you get through it somehow. Trust me, you can live without a lot of the food you thought you needed. You’ll be called an inspiration. Yeah, us, I mean, what?! I can’t tell you the amount of kindness I received, even from strangers. I’m still the same person inside you were, but I’m working on being more confident. You never knew what you could accomplish if you just gave yourself that chance. Not to say it’s been easy, but it’s been worth it. You have a blog. Yeah, Mr. Anti-social. I’m still congenitally shy, but I’m taking it all on my own terms. No more having others dictate the pace and ending up getting hurt. You’d be surprised how many people I’m reaching with my recipes. All those French recipes you learned paid off, they taught you well. People are really kind and supportive. Your feet shrunk. Yeah, freaky I know. Dude, I’m going to lose my readership, but it has to be said: Pooping is really great. You have a kitchen garden now, more vegetables and fruit that you ever needed. Not only that you have plans for the future. You’re into DIY now, that big store of ideas that rattled around your lumpy head is getting used. You’re not half as green as you thought you were cabbage looking. I haven’t done myself a mischief with the drill either. It’s going to be beautiful, there’s a peace there, in the evening when everything is still, the world carries on but the garden is frozen for a few wonderful brief moments in the dusk. I’ve gotten into Japanese indie Bands. Thank Go! Go! Hypergrind for that. We never could like something mainstream, could we? You lost more weight than you ever imagined. Remember when you got your first tattoo you thought it’d stop soon after that? Nah, you went further than that by a lot. You also got a second tattoo. A literary one just like you always wanted. There’s probably more, but there’ll be other times, more anniversaries. Just know that I’m grateful, you asked yourself one question, whether it was better to sink or swim, to live a living death and to fade away or to take your chance and burn out if needs be, but you’re still here, maybe more than ever. It’s not easy, our life never has been. But I’m still here. Thank you for that.